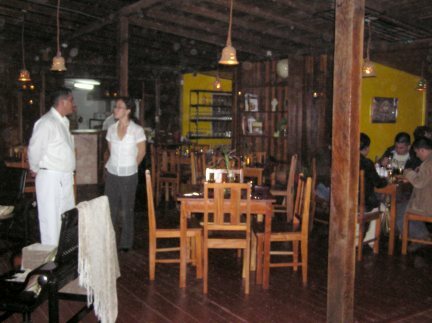 Volcan is not short of restaurants – we have more than thirty five – what we are short of is good quality places to eat. On September 14th of this year, the warm, hospitable and authentic taste of Italy came to Volcan. 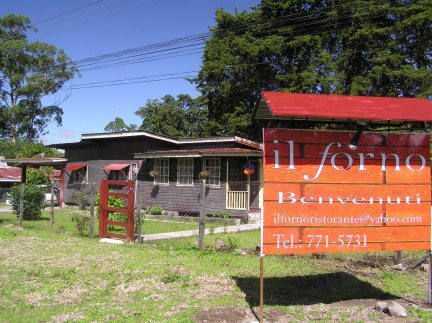 Il Forno (the oven in Italian) was opened by forty three year old Italian/American Joseph Mattina, and his Panamanian wife Aliss. 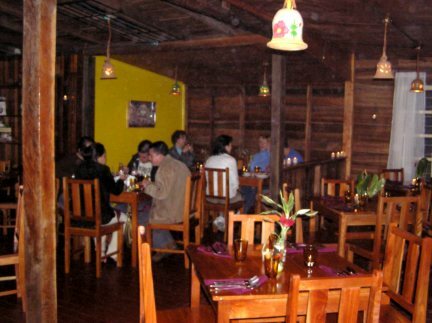 The restaurant building was originally a modest wooden home. With the removal of several interior walls and the construction of a gas-fired brick oven, the transition from old home to up-scale restaurant was achieved. The heart and soul of any restaurant is the chef, and Joseph Mattina clearly has both heart and soul in Il Forno. He was born in New York to Italian (restaurant owning) parents and at the age of 14 Joseph returned with his folks to their birthplace's of Salerno and Palermo. This is where Joseph absorbed the true nature of, and learned the subtleties of what makes Italian cooking so vibrant and spicy. On a visit to Panama Joseph met and fell in love with Aliss Hartmann. Aliss is one of the youngest members of the famous Hartmann family – arguably one of the founding families of Panama. Together they set out to establish what could become Volcan's most popular restaurant. The initial trials and tribulations were overcome, including having to open an Italian restaurant without wine – the liquor licence was finally granted after a dry and exasperating first week in Business. The food is definitely upscale but fortunately the prices are not. Pasta primavera is just $5.00, Lasagna $6. 00 and you can have an ante-pasto starter for just $4.00. A large pizza will set you back $11.00, but this is more than enough for two persons. At the start of each meal you are given a complementary basket of home made bread and a dip of roasted garlic cloves in olive oil. In addition to baking their own bread the restaurant also makes its own Ricotta cheese. 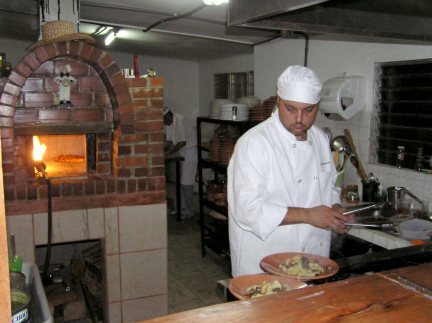 When my wife and I lived in Nicaragua there was an Italian restaurant that served a pasty type Italian pie called a “Stromboli.” Named after Italy's ever active Volcano. I asked Joseph if he could make a similar dish. 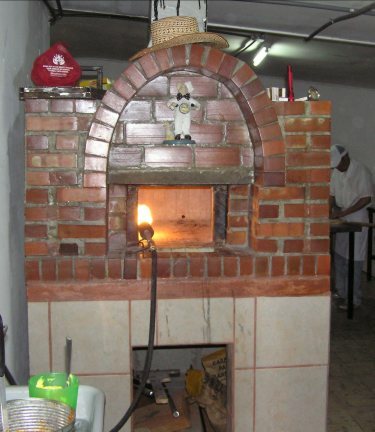 It wasn't easy – for one thing a stromboli normally takes about 8 to 10 minutes to cook and Joseph's oven can cook a pizza in 3 minutes. Patiently, Joseph experimented and my wife, and I dutifully became the tasters. The first attempts were good, but something was lacking. Finally, I asked Joseph if he could put the chopped tomatoes into the mix uncooked. This he did and Viola! A gastronomic success. If the chef is the most important factor in a successful restaurant then the second important thing is its reputation. This is something a restaurant has to earn with good, consistent, food and service. Il Forno has been open for just over a month and has earnt the distinction as Volcan's most popular restaurant. The Chiriqui highlands are lush and green, thanks to the over abundance of the liquid sunshine. On those dark dreary, rain filled nights there is a place awaiting you that welcomes you with the warm glow of soft lights and candles. Where the food and ambiance will enchant you, but your wallet will hardly feel a thing.